Ridgeway Radio is pleased to tell you about a new beautifully produced book of stories and poems from Dorset writer Sue Worth, now available from Waterstones, South Street, Dorchester. 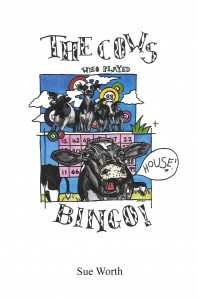 In the ‘The Cows Who Played Bingo’ a range of characters from the 1950’s to the present day tell their stories directly to the reader in everyday English, easy to read dialect or a mix of both. The book includes stories Sue heard as a child growing up in Stratton or while working and living in West Dorset and variously published in The Countryman, broadcast on BBC Radio 4 and BBC Radio Solent (competition judged by Kate Clanchy who encouraged Sue when she read her winning poem ‘My Place’ on air), read by The Orchard Theatre Company and performed by The New Hardy Players and others. The one people are most likely to have heard is the humorous ‘Arringe Juice an Moosli’ which Brian Caddy has performed across Dorset and beyond. In it an older agricultural worker takes it on himself to educate a young college chap who’s arrived unprepared for working the land in winter – and just what might he have had for breakfast? Evocative illustrations from local artists Naomi Price and Liz Poulain. 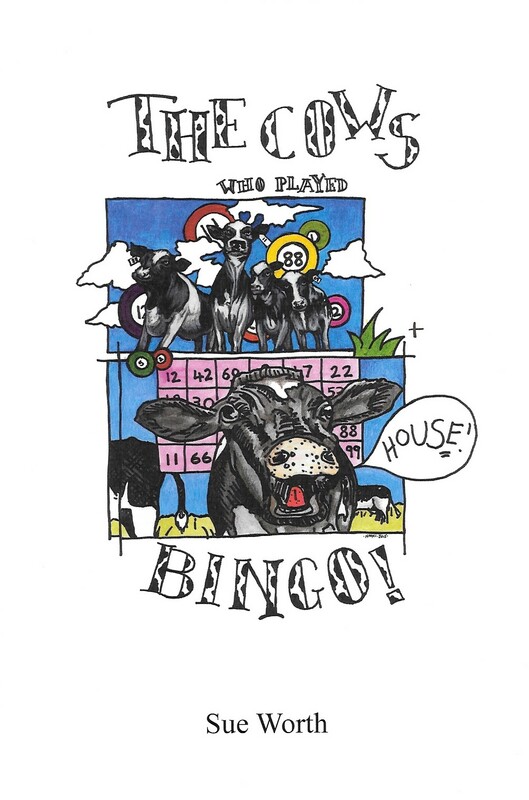 The Cows who Played Bingo available from Waterstones, South Street, Dorchester. Sue Worth. Born in 1951 into a Dorset awash with stories and spent her childhood in village of Stratton. Now retired Sue worked in West Dorset Hospitals as Carer, on Clinical Audit in Critical Care and latterly managing a clinical system in I.T. Department. Sue is married to Andy, who has always supported her writing and they have 3 children. 2 sons and their daughter Naomi Price who with Liz Poulin contributed the fabulous illustrations for the book. Sue has written for and performed with the New Hardy Players. She both wrote and co-directed an adaptation of the Withered arm performed during this Dorchester Literary Festival by the New Hardy Players. Three were sell out performances with an additional performance requested at Briantspuddle.